So you want to be an artist, but have absolutely no real credible talent in art? Join the club. You are absolutely sure you want to be an artist? Well okay then, I am going to let you in on a little secret that will get you into art without actually having to do anything. The secret is Art That Looks Like Nothing. More commonly referred to as abstract, or modern artwork, among members of the club, so that the secret will never be revealed. 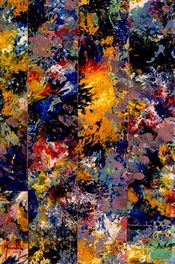 It is actually very easy to make these "abstract" and "surreal" paintings, or sculptures, or whatever your medium of choice is. When you finish make sure you give it a trippy name, so that the critics will refer to it as either abstract or surreal, and thus, think it is brilliant. Art that looks like nothing developed as an icon of the 1930's, where poor people who suffered greatly from the great depression needed to find a way to make a quick dollar without putting forth much effort at all. After marketing their work under the title of abstract, or surreal, the poor families made a killing. Having found this new gold mine of salvation, art that looked like nothing began zooming into people's homes, giving them a great outlook on the bleak future, and giving America hope for a new beginning. Following World War 2, many artists who produced art that looks like nothing during the war began to reap the benefits of the new economy. They made more money than they could have ever imagined. However, this, unfortunately, lead to the decline of art that looks like nothing. With the money being made by the second from sales of the magnificent art that looks like nothing, artists began to quit while they were ahead. They already had a steady pension plan coming in from the artwork they had already produced, and that money was theirs to keep, however if anyone caught on to their scheme, then they could face very hefty charges and fines. Thus, they left the market of Art that looks like nothing forever, or did they? Following the Viet Nam War, people looked for the beautiful art that looks like nothing, but found that quantities were very slim, and prices had skyrocketed, leaving many homes without the beauty of this art. Seeing the exploiting that could be done from this new demand for art that looks like nothing, many new, young artists arose from the ashes of the fallen artists of art that looks like nothing, and begun producing art that looks like nothing at exceptional rates. With this new birth of art that looks like nothing, many people made their lives complete by buying brand new art that looks like nothing, and even buying remakes of some of the classic art that looks like nothing. The ways of the new artists have continued to grow over the decades, and have reached impressive sales by the present time with many people learning the secret of the art that looks like nothing, art that looks like nothing has become one of the most world-renowned forms of art there is, and nobody suspects a thing! 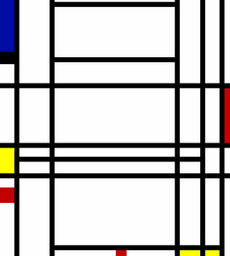 Piet Mondrian's "Composition 10" the cornerstone of art that looks like nothing. Piet Mondrian is considered the father of art that looks like nothing. He began working on art that looks like nothing long before it became popular to do so in the 30s. Mondrian created a series of artworks that featured several black lines, and red, yellow, and blue boxes intertwined within the black lines. This set of art contained 13 pieces, which Mondrian created on one rainy Thursday afternoon in 1920. Mondrian understood the way to sell his artwork, giving them names like "Composition 10", "Composition of Yellow, Blue, and Red", and "Composition II of Yellow, Blue, and Red", which were so outrageous that people couldn't help but spend hundreds of dollars on them. Piet Mondrian continued putting out art that looks like nothing for years during the 1920s, up until his death in 1929, shortly before the boom in creation of art that looks like nothing in 1932. It is a true shame that he could not see what an influence his art that looks like nothing had on the future of art that looks like nothing. Modern day artists of art that looks like nothing have paid their respects to Piet Mondrian, remaking his artwork, and selling it for their own gain, just as Mondrian would have wanted. You would be surprised at how much money remaking a bunch of black lines would bring in. That is why many aspiring artists of art that looks like nothing begin by remaking old popular Mondrian works. Recent advances in the paintball field have allowed multiple colors to be used in one gun, making the use of a paintball gun much easier. So you are sure you want to become an artist for art that looks like nothing? Okay then. The first thing you need to know is the tools that you should use. Art that looks like nothing can be made from almost anything you can possibly think of. Traditional art that looks like nothing has been created using a standard paintbrush, however with technological advances of time we are now able to use almost anything. Quick artwork has been made by repeated firing at a blank canvas with a random assortment of colors from a paintball gun, and that has become one of the most used forms of creation. However if you are going to go the traditional way, and want to remake a Piet Mondrian masterpiece, you should probably go with the traditional paintbrush, however if you are strapped for time you could still use the paintball gun to make these paintings, besides, if it doesn't come out looking like a Mondrian masterpiece, you can always market it as your own work. If you actually care about how good your art that looks like nothing looks, then you probably shouldn't have taken up making art that looks like nothing, however if you are hell-bent on becoming an artist that makes art that looks like nothing, but still want your work to look good, then you can always use a fine-tooth paintbrush. Other than that, you basically have free reign to test anything you want. Well, now you can make your masterpieces. You have learned everything that there is to know about art that looks like nothing and its history, you are fully prepared to spend one rainy afternoon just sitting in your garage, shooting a blank canvas with a paintball gun. Honestly it is a great deal of fun, and it will make you a massive amount of money. For those without comedic tastes, the so-called experts at Wikipedia have an article about art that looks like nothing. ↑ Which is referred to by many as the cornerstone to art that looks like nothing. ↑ however why you would ever want to is beyond me, you will get paid the same as you would have without it. This page was last edited on 29 June 2012, at 06:30.